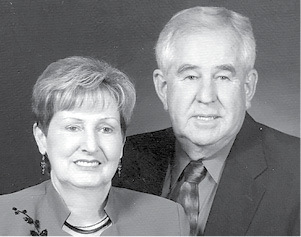 James Clayton and Kathryn (Owens) Brown will be celebrating their 60th Wedding Anniversary this week. They were married on February 7, 1959. They have three daughters: Virginia (Richard) Richardson, Cindy (Tim) Choate and Lezlee (Kevan) Young. They have seven grandchildren: April (Jay) Hatcher, Ashley Richardson, Clay Choate, Kyle Choate, Abbi Young, Cannon Young, and Bella Young. They also have three great-grand children: Gracie Richardson, Eli Hatcher and Liam Hatcher. We are thankful that God has blessed them with many happy years together.